Back at the hotel from a full day of meetings at the Winter OR show in Salt Lake City. 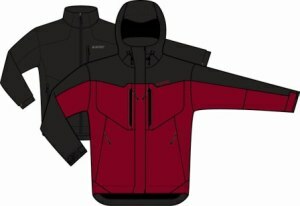 I saw new products from companies like The North Face, Timberland, Granite Gear and others. Here are a few that stood out. Big guy on a tarp! 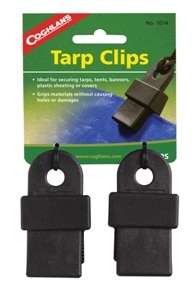 Coghlan’s (www.coghlans.com) makes a ton of accessories for campers and one of the seven new products that caught my eye was their Tarp Clips. Their clips use a friction system as opposed to spikes but the noteworthy part is their claim of being able to support up to 240 pounds on a tarp. While holding them in my hands I couldn’t see how it would hold but the company claims it does. The Gear Junkie crew will have to put that claim to the test! Hi-Tec (www.hi-tec.com), known for making ultra-light footwear, debuted its first entry into the apparel market. Utilizing the same ion-mask technology found in its boots, Hi-Tec has created a line of outerwear focused on performance and value. The jacket comes with a fleece insert and they applied the ion-mask technology there to make the whole setup more windproof.